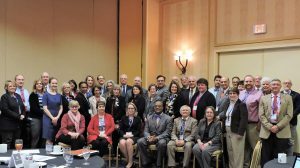 Leaders of the state’s public higher education institutions — both two-year community and technical colleges and four-year colleges and universities — launched the Momentum Pathways Project, a key initiative towards meeting the state’s educational workforce needs through student persistence to degree attainment. CHARLESTON, W.Va. – West Virginia higher education leaders committed today to the state’s Momentum Pathways Project, a program that uses proven strategies to improve student success during the first year of college and sustain that momentum through to graduation. The group representing the state’s public higher education institutions met today along with national experts to discuss strategies that increase student retention and graduation. The event was hosted by the West Virginia Higher Education Commission (HEPC), the Community and Technical College System of West Virginia (CTC), and Complete College America (CCA). The Momentum Pathways Project will focus on 15 to Finish, adviser training, and the use of degree maps. A research-based initiative originally launched in Hawaii, 15 to Finish encourages students to take 15 credit hours per semester or 30 per year, increasing their likelihood of success and ensuring that they graduate on time. Efforts around adviser training and degree maps will simplify the maze of academic courses and student requirements by creating easy to follow academic maps, design support services that increase success for adult learners, and create structured schedules that allow students to balance work, life, and academics. Dr. Sarah Tucker, chancellor of West Virginia’s community college system, said within the next two years, more than 51 percent of West Virginians will need formal education or training beyond high school if they want a good job. Presidents Mirta Martin and Kendra Boggess, of Fairmont State and Concord universities, respectively, commit their institutions to the Momentum Pathways Project with the signing of the pledge card. Since 2012, West Virginia has been working with CCA to increase the number of West Virginians with a certificate or degree beyond a high school diploma. West Virginia has implemented key components of CCA’s strategies with success in recent years, including redesigning developmental education statewide and enrolling more students in 15 or more credit hours per semester. These programs are increasing college student retention rates and promoting timely graduation.